If you've already signed up for Amazon Web Services (AWS), you can start using Amazon EC2 immediately. You can open the Amazon EC2 console, choose Launch Instance, and follow the steps in the launch wizard to launch your first instance. When you sign up for Amazon Web Services (AWS), your AWS account is automatically signed up for all services in AWS, including Amazon EC2. You are charged only for the services that you use. With Amazon EC2, you pay only for what you use. If you are a new AWS customer, you can get started with Amazon EC2 for free. For more information, see AWS Free Tier. Note your AWS account number, because you'll need it for the next task. Services in AWS, such as Amazon EC2, require that you provide credentials when you access them, so that the service can determine whether you have permission to access its resources. The console requires your password. You can create access keys for your AWS account to access the command line interface or API. However, we don't recommend that you access AWS using the credentials for your AWS account; we recommend that you use AWS Identity and Access Management (IAM) instead. Create an IAM user, and then add the user to an IAM group with administrative permissions or grant this user administrative permissions. You can then access AWS using a special URL and the credentials for the IAM user. If you signed up for AWS but have not created an IAM user for yourself, you can create one using the IAM console. If you aren't familiar with using the console, see Working with the AWS Management Console for an overview. Enter the IAM user name (not your email address) and password that you just created. When you're signed in, the navigation bar displays "your_user_name @ your_aws_account_id". To verify the sign-in link for IAM users for your account, open the IAM console and check under IAM users sign-in link on the dashboard. For more information about IAM, see IAM and Amazon EC2. AWS uses public-key cryptography to secure the login information for your instance. A Linux instance has no password; you use a key pair to log in to your instance securely. You specify the name of the key pair when you launch your instance, then provide the private key when you log in using SSH. If you haven't created a key pair already, you can create one using the Amazon EC2 console. Note that if you plan to launch instances in multiple regions, you'll need to create a key pair in each region. For more information about regions, see Regions and Availability Zones. Sign in to AWS using the URL that you created in the previous section. From the AWS dashboard, choose EC2 to open the Amazon EC2 console. From the navigation bar, select a region for the key pair. You can select any region that's available to you, regardless of your location. 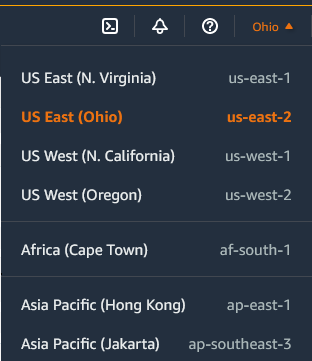 However, key pairs are specific to a region; for example, if you plan to launch an instance in the US East (Ohio) Region, you must create a key pair for the instance in the US East (Ohio) Region. The navigation pane is on the left side of the console. If you do not see the pane, it might be minimized; choose the arrow to expand the pane. You may have to scroll down to see the Key Pairs link. Enter a name for the new key pair in the Key pair name field of the Create Key Pair dialog box, and then choose Create. Use a name that is easy for you to remember, such as your IAM user name, followed by -key-pair, plus the region name. For example, me-key-pair-useast2. The private key file is automatically downloaded by your browser. The base file name is the name you specified as the name of your key pair, and the file name extension is .pem. Save the private key file in a safe place. This is the only chance for you to save the private key file. You'll need to provide the name of your key pair when you launch an instance and the corresponding private key each time you connect to the instance. If you will use an SSH client on a Mac or Linux computer to connect to your Linux instance, use the following command to set the permissions of your private key file so that only you can read it. If you do not set these permissions, then you cannot connect to your instance using this key pair. For more information, see Error: Unprotected Private Key File. For more information, see Amazon EC2 Key Pairs. To connect to your Linux instance from a computer running Mac or Linux, you'll specify the .pem file to your SSH client with the -i option and the path to your private key. To connect to your Linux instance from a computer running Windows, you can use either MindTerm or PuTTY. If you plan to use PuTTY, you'll need to install it and use the following procedure to convert the .pem file to a .ppk file. Download and install PuTTY from http://www.chiark.greenend.org.uk/~sgtatham/putty/. Be sure to install the entire suite. Start PuTTYgen (for example, from the Start menu, choose All Programs > PuTTY > PuTTYgen). Under Type of key to generate, choose RSA. Choose Load. By default, PuTTYgen displays only files with the extension .ppk. To locate your .pem file, select the option to display files of all types. Select the private key file that you created in the previous procedure and choose Open. Choose OK to dismiss the confirmation dialog box. Choose Save private key. PuTTYgen displays a warning about saving the key without a passphrase. Choose Yes. Specify the same name for the key that you used for the key pair. PuTTY automatically adds the .ppk file extension. Amazon VPC enables you to launch AWS resources into a virtual network that you've defined, known as a virtual private cloud (VPC). The newer EC2 instance types require that you launch your instances in a VPC. If you have a default VPC, you can skip this section and move to the next task, Create a Security Group. To determine whether you have a default VPC, open the Amazon EC2 console and look for Default VPC under Account Attributes on the dashboard. If you do not have a default VPC listed on the dashboard, you can create a nondefault VPC using the steps below. From the navigation bar, select a region for the VPC. VPCs are specific to a region, so you should select the same region in which you created your key pair. On the VPC dashboard, choose Launch VPC Wizard. On the Step 1: Select a VPC Configuration page, ensure that VPC with a Single Public Subnet is selected, and choose Select. On the Step 2: VPC with a Single Public Subnet page, enter a friendly name for your VPC in the VPC name field. Leave the other default configuration settings, and choose Create VPC. On the confirmation page, choose OK.
For more information about VPCs, see the Amazon VPC User Guide. Security groups act as a firewall for associated instances, controlling both inbound and outbound traffic at the instance level. You must add rules to a security group that enable you to connect to your instance from your IP address using SSH. You can also add rules that allow inbound and outbound HTTP and HTTPS access from anywhere. Note that if you plan to launch instances in multiple regions, you'll need to create a security group in each region. For more information about regions, see Regions and Availability Zones. You'll need the public IPv4 address of your local computer. The security group editor in the Amazon EC2 console can automatically detect the public IPv4 address for you. Alternatively, you can use the search phrase "what is my IP address" in an Internet browser, or use the following service: Check IP. If you are connecting through an Internet service provider (ISP) or from behind a firewall without a static IP address, you need to find out the range of IP addresses used by client computers. Alternatively, you can use the Amazon VPC console to create a security group. However, the instructions in this procedure don't match the Amazon VPC console. Therefore, if you switched to the Amazon VPC console in the previous section, either switch back to the Amazon EC2 console and use these instructions, or use the instructions in Set Up a Security Group for Your VPC in the Amazon VPC Getting Started Guide. From the navigation bar, select a region for the security group. Security groups are specific to a region, so you should select the same region in which you created your key pair. Choose Security Groups in the navigation pane. Enter a name for the new security group and a description. Use a name that is easy for you to remember, such as your IAM user name, followed by _SG_, plus the region name. For example, me_SG_uswest2. In the VPC list, select your VPC. If you have a default VPC, it's the one that is marked with an asterisk (*). Choose HTTP from the Type list, and make sure that Source is set to Anywhere (0.0.0.0/0). Choose HTTPS from the Type list, and make sure that Source is set to Anywhere (0.0.0.0/0). Choose SSH from the Type list. In the Source box, choose My IP to automatically populate the field with the public IPv4 address of your local computer. Alternatively, choose Custom and specify the public IPv4 address of your computer or network in CIDR notation. To specify an individual IP address in CIDR notation, add the routing suffix /32, for example, 203.0.113.25/32. If your company allocates addresses from a range, specify the entire range, such as 203.0.113.0/24. For security reasons, we don't recommend that you allow SSH access from all IPv4 addresses (0.0.0.0/0) to your instance, except for testing purposes and only for a short time. For more information, see Amazon EC2 Security Groups for Linux Instances.